04 | March | 2011 | WHAT A FEELING! November. The word itself seems to encourage inactivity: it’s a fat, lazy month full of food and football, a languid lull before the storm of the holiday season. Novemberitis has traditionally infected movie studios as much as anybody else; it’s usually a slack time for new movies, as distributors prepare to release all their blockbusters during the Christmas holidays. This is the time of year when small, serious films find their way to movie screens. Title such as Testament, Boat People, and Nicaragua: Report From the Front, have all appeared locally in the last fortnight. Ambitious films such as Bob Fosse’s Star 80 get their couple of weeks in the sun before the December onslaught. But the studios can’t give the hungry public a steady diet of art films. Besides, there must be something offbeat sitting on the shelves, some weird little movie that didn’t seem releasable before; why not spring it on an unsuspecting nation during this slow November? Maybe that’s what Nate and Hayes is. Believe me, I don’t know what other explanation to give. 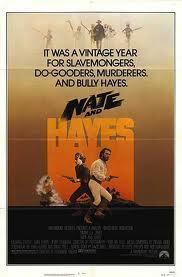 Nate and Hayes is this pirate movie, with Tommy Lee Jones as the swashbuckling “Bully Hayes,” whose real-life adventures are on vivid display. Did I say real-life? Sorry. That could be misleading; nothing in Nate and Hayes comes close to resembling reality as we know it. But that’s okay; the idea here is to present non-stop action al a Raiders of the Lost Ark, not give a documentary account of the hardships of pirate life. This Hayes fellow escorts a young missionary couple to a South Sea island. Later, when the girl is kidnapped by a band of marauders, Hayes helps the young hero recover the bride. Complication: Hayes loves the lass, too. It’s the latest retelling of the 1956 western The Searchers, a favorite of young filmmakers for years (Star Wars was partially inspired by it). This time out, it’s done with jokes and acrobatics, and no time out for characterization or seriousness. The surprising thing is that some of this is pretty enjoyable. The dialogue bulges with wisecracks, probably from the pen of John Hughes, who has scripted a lot of National Lampoon projects. And director Ferdinand Fairfax has given an appropriate flair to the cartoonish proceedings, especially during the exciting opening sequence, during which Hayes runs guns and trades one-liners with some unimpressed women savages. So, great art it’s not. And it takes a long time in completing its 90 minutes of life. But, if I were a 10-year-old, I might find Nate and Hayes very easy to take, especially on a rainy November afternoon when there wasn’t much new on TV anyway. No such dewy lyrical reflection on the attributes of November is possible today; if the Christmas season isn’t in full swing by November 10, something is very wrong in Hollywood. This odd picture is suspected by some IMDb posters as being the basis for the plot of Pirates of the Caribbean, but it seems more likely that both draw from the same generic well. I didn’t bother to mention that Michael O’Keefe, whose name actually sounds like a pirate, played the other title role in the film; this was just after The Great Santini and Caddyshack, so O’Keefe looked as though he might be turning into something. His next film was Richard Lester’s Finder Keepers, which memory tells me had its moments, but after that he turned into a working actor. I think the film’s original title was Savage Islands, and I remember thinking at the time of its release how lame a title Nate and Hayes was, a desperate attempt to make the movie sound like a buddy film (and giving the wrong guy top billing, too). The other funny note is John Hughes, still a year away from breaking through. You are currently browsing the WHAT A FEELING! blog archives for the day Friday, March 4th, 2011.